This is my second post celebrating the launch of idibu’s new recruiting report “The changing face of recruitment”. In the first post we looked at the four key stages of modern recruiting – and here I’d like to build on that by looking in greater depth at the importance of engaging and building relationships on social media in today’s recruitment market. I hope these insights are helpful – and encourage you to download a copy of the full report (below) if you haven’t done so already. The data in idibu’s report shows that it’s the relationship that candidates have with recruiters that is the stand-out factor in winning candidates over and seeing them progress all the way through to being successfully hired. This, the findings suggest, is more important than your team’s sector knowledge, more important than the appeal of the specific roles you are looking to fill. In a market where it’s commonplace for candidates to drop out of the recruiting process – or never respond to your original advances in the first place – the positive impact of engaging and building stronger candidate relationships is therefore a crucial differentiator. Success here requires focusing on three distinct elements of mass engagement on social media. Firstly, we want our message to reach a sizeable proportion of our target candidate market. Secondly, we want to generate social proof – or the endorsement by others of our recruiting brand. Then, last but not least, we want to engage with people individually so that they feel as though they have a personal connection with our team and an affinity for the business. Let’s take each of three elements in turn. To maximise the engagements we have with our target candidate audience, we first need to maximise the reach our social media updates have within our target market. Every time someone comments on one of our updates or shares it with their network, that’s the perfect excuse to start a conversation with them and build the foundations of a stronger candidate relationship. It stands to reason that the more people who are seeing our updates, the more such interactions there will be over time. Add into the mix that the people seeing your updates are highly targeted and you have the perfect recipe for engaging and building relationships with the exact talent pool that your business will need over the coming years. How to build the reach of your recruiting team’s social media presence would be an entire article in itself. But one quick win I would share here – that ties in with engaging – is the practice of winning over influencers in your market. Whichever niche market you operate in, there will be individuals and organisations out there that already reach a sizeable audience of the exact people your recruiting team would like to reach. 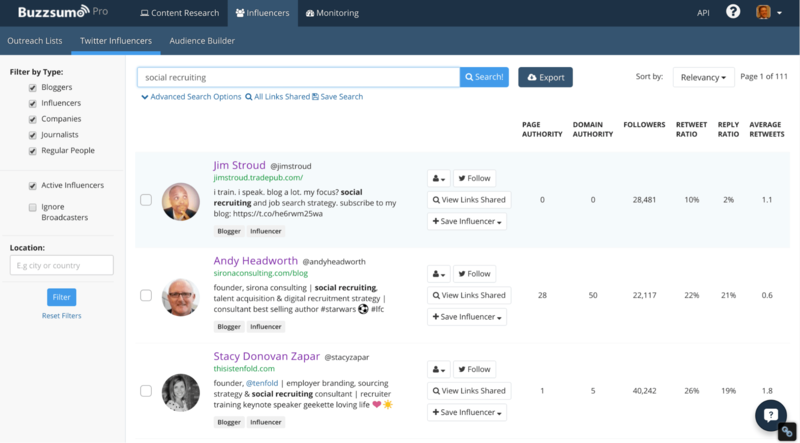 Using a tool such as BuzzSumo, you can research and identify who those influencers are – and more importantly, which of them are most likely to start sharing your updates if you succeed in befriending them. Experiment with this for just 1-2 months and you’re sure to start seeing your posts being reshared by others in your industry whose combined reach will multiply the audience you are reaching several fold. There’s nothing more certain to make people pay attention to your social presence than seeing others they know and respect sharing your posts or interacting with you directly on social media. This is a form of social proof and is extremely powerful in building the credibility of your social profiles and increasing the likelihood that others will start to engage with you. You only really need two things to do this well – time and personality! Consider for a moment most people’s experiences of using social media. Someone commenting on something they’ve shared, or re-sharing it with a compliment or remark about how this is relevant, would be a rarity in that person’s week. So by taking the time to do this consistently in your industry, you build a rapport with people that puts you way ahead of the game and really makes your recruiting team stand out. Keep in mind that these things are often reciprocated. So if you interact with 100 people from your industry in this way, the chances are that in the weeks to come you’ll see dozens of them paying particular attention to your updates and starting to reshare them and comment on them themselves. Better still if you have the personality that you can do this in a way that feels really natural and unforced. Getting to the point that you have lots of people in your industry providing the social proof that others should pay attention to your accounts should be well within the reach of anyone reading this article. Taking this a step further, we ideally want to start interacting with as many candidates as possible in our market. Absolutely the easiest way to do this is just to look out for every person who’s shared content from your site, commented on one of your posts, or perhaps re-shared or liked one of your updates. This is an open goal, because their action means it’s totally natural for you to reach out and thank them, or ask what they particularly liked about the post, or enquire which of those challenges they are seeing the most in their market. These interactions are short – especially if on Twitter – but they have the effect of making people feel like they know someone in your company, giving them an affinity for your recruitment brand and the reassurance that they like the kinds of people who work there. Of course there’s almost no limit to how much time you could invest in such activities. Depending on your hiring priorities, you might opt for a blanket approach to cover your whole market; or a highly targeted approach to focus your efforts on just a few hundred key hires and influencers in your industry. What I hope you’re taking from this article is that engaging and relationship building are crucial in recruiting today. This is an area where a recruiter can really make their mark and give the company a competitive advantage. In a world where there are more and more tools for researching and direct messaging your ideal candidates, the battle for talent stands to be won by those companies that can achieve the highest conversion rates in their recruitment process. Imagine you achieve an InMail conversion rate that’s significantly better than your competitors, bringing more candidates into your hiring process than your competitors are able to. Now imagine that those candidates have a higher probability of going through your whole hiring process and accepting an offer of employment. At every stage in the process, the relationships you’ve built with candidates will help you to successfully win over more of the target candidates you’ve identified. Therein lies the value of investing in such activities and I hope this article has given you some insights into how you might achieve this. Do be sure to download the idibu report (below) for other insights that’ll help you to ramp up your recruiting performance this coming year. This guest post was contributed by Tony Restell, Founder of social media agency Social-Hire.com and a respected guest speaker on topics related to recruiting and social media. Follow Tony on Twitter at @tonyrestell.